When a veteran 911 operator takes a life-altering call from a teenage girl who has just been abducted, she realizes that she must confront a killer from her past in order to save the girl’s life. 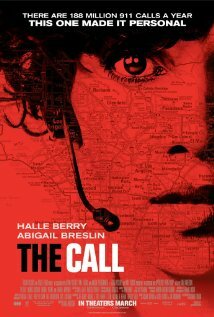 The Call is a tense thriller that fully explores and delivers on its premise. Everything feels like it’s happening before us. Solving one problem creates another and time always seems to be running out. I watched this with my family and it was so gripping that they became totally responsive to it. They were covering their eyes, flinching and screaming at the television at different points. Thriller movie elements aside, director Brad Anderson brings the audience inside the world of police procedures and emergency call centers. It is well researched and minute with its real world details. The things that we don’t like to know or look at in real life crimes and murders are drawn as a source of tension. The stress and emotional detachment that is required in being an emergency operator is incorporated dramatically into the story. Together this washes away the genre conventions of a typical cop film and instead feels like we are looking into the lives of real-life police officers handling crime. This is not Halle Berry’s most demanding performance but she does effectively transport the audience into her plight. Berry plays a lot of emotions despite being confined at a desk for a majority of the film. It’s a very pronounced performance. Morris Chestnut seems too aware of himself to really convince me of his character. It seems like he’s always detached from his own environment. There’s a bit of a sick pleasure in watching Abigail Breslin being kidnapped because she was so profoundly annoying in Definitely Maybe. That’s probably me being mean. But here, Breslin plays the situation very real. Michael Eklund is convincingly creepy as the scene-stealing villain. The scariest thing about serial killers or murderers in real life is that nobody ever looks like a serial killer. They all appear as normal people and are protected by the benefit of the doubt. Eklund’s character practically shifts the film into horror film territory. As it moved toward to the finale, even on the very edge of my seat, I was still secretly wishing for something to really wow me at the end. I don’t know if it was because I liked The Machinist and developed an expectation from Brad Anderson. There were about two three ways the story could have finished that would have been fine, but nothing mind-bending. But it did deliver. My secret wish was fulfilled. The finale to The Call is a gutsy, left-turn ending that pulled the rug right under me. As it went to black, my mouth went agape pondering about what the fates of all the characters. With the current trend of long running two-hour films, any film that has the discipline to wrap up around 90 minutes is praiseworthy. There is no fat to be trimmed here. The Call might be a film that goes unnoticed under the radar with its lower budget and hype. I saw it on DVD myself. It is the tensest movie I’ve seen this year. Hopefully there’s less lag time from now till Brad Anderson’s next project.